Abstract – This paper presents an integrated mixed-signal DC-to-AC converter for electroluminescent (EL) displays, featuring a digital synthesis of the required output waveform. The circuit is integrated with a 2.0mm 50V CMOS technology and is capable of driving EL displays with a power consumption of up to 4.5VA. It is suitable for standalone applications as well as for applications in clusters digitally controlled by a microcomputer. Electroluminescent (EL) displays have been used for more and more applications during the past years, ranging from luminous wristwatch dials to background illumination of industrial control panels, aircraft cockpits, automotive dashboards and general display and advertising applications. Due to their longevity, thinness, and homogeneous light distribution, they are a far more eye-friendly and space-saving option than LEDs, incandescent or fluorescent lamps, and TFT displays. EL displays are also referred to as "light emitting capacitors". ZnS crystals embedded in a dielectric polymer are excited electrically to radiate. An AC voltage has to be applied to the capacitor electrodes with at least one of them being translucent. The color of radiation can be varied from green to white, orange, amber and blue by means of doping of the ZnS crystals . The hue is also dependent on the frequency of the AC voltage applied. EL displays require AC voltages from 20 to 250VRMS with frequencies ranging from 50Hz to 10kHz. As these voltages are not commonly available in electronic systems, a DC-to-AC conversion procedure has been devised that permits efficient control over the parameters needed to supply EL displays. Figure 5 depicts a standard application of the DC-to-AC converter. The EL display is fed via an EMC filter and a transformer in order to reach the required voltages. The excitation voltage of the EL display is fed back via DR, RR1 and Rf1 to a control input and can therefore be exactly regulated. Loop stability is achieved by dominant pole compensation through CR. The excitation voltage RMS value determines the brightness of the EL display. The nominal value has to be set by RSET. A more elegant control method is achieved by measuring the actual brightness of the EL display by means of a photosensitive device in order to compensate fluctuations in the luminance due to aging and temperature variation. In order to remotely control the brightness, a pulse-width-modulated signal is applied at input SD. For simplest applications, the feedback control loop can be omitted and the whole circuit can be operated in a feedforward output voltage adjustment mode. Adjustment of the output frequency is achieved by applying appropriate signals to inputs FS to FS. Ease of application was a primary goal of the design, hence all control inputs are internally set to default values, permitting "plug and play" operation. The entire circuit can be fed by a single supply voltage ranging from 12 to 36V and is therefore compatible with mobile and industrial power supplies. Figure 7 shows the internal building blocks of the DC-to-AC converter. The circuit is divided into an analog, a digital, and a HV section. The analog section consists of the operational amplifier for the control loop, a 11.47 MHz clock oscillator, a 5 bit successive approximation ADC, several reference voltage regulators, the overtemperature and overcurrent protection, and the power-on reset and soft-start function. The digital section is composed of the clock divider for frequency control, the sinewave counter, a multiplier, and a digital comparator for generation of the pulse-width modulated gate control signals of the H-bridge. The HV section consists of the HV level shifters, the dead-time generators for the H-bridge and four lateral HV MOSFETs, each designed for driving up to 500mA. A freewheeling sine wave counter generates a 4 bit approximation of an ideal sinewave (cf. Table 3). Subsequently, the sinewave output value is multiplied by the output of the 5 bit successive approximation ADC. The output of the ADC is updated only on positive zero crossings of the sinewave in order to avoid spurious distortions of the sinewave, and hence, EMC problems. The product is an 8 bit representation of the desired output voltage. Conversion into a pulse-width-modulated signal is achieved by digitally comparing the product with the output of an 8-bit binary counter. The total on resistance of a H-bridge is nominally below 5 W (cf. Figure 2). During the On phase tP1 of the PWM signal, the current I1 flows from VP via PMOS1, the primary transformer winding, and NMOS2 to GND (cf. Figures 2 and 3). After tP1 , PMOS1 is switched off and the current through the primary transformer winding continues to flow as I2, due to its self-inductance. At first, I2 flows trough the parasitic diode of NMOS1. After the dead time td , NMOS1 is switched on in order to minimize losses. The challenge was to optimize td for maximum overall efficiency. The same dead time is applied between switching off NMOS1 and switching on PMOS1 in order to avoid short circuit currents flowing through PMOS1 and NMOS1 in series . The dead time is generated by a two stage shift register, generating a delay of 2 clock oscillator cycles. Figure 4 illustrates the conversion of the pulse-width modulated H-bridge output signals into a sinusoid. The uppermost trace shows signal H1, the second trace shows signal H2, and the third shows the voltage at the secondary side transformer terminals. The load waveforms are sinusoidal, and therefore produce very low spurious emissions. The design of the DC-to-AC converter was carried out on a CADENCE design environment utilizing devices and sub-blocks of the Austria Mikro Systeme AMS Hit-Kit. Analog and mixed signal simulations have been executed with the SpectreS - VERILOG simulator. For digital design and synthesis the VERILOG hardware description language was used in conjunction with the SYNOPSIS silicon compiler. 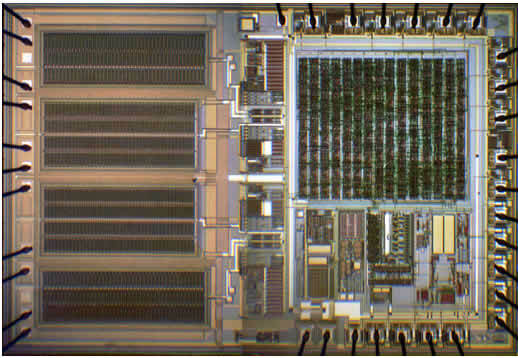 Figure 6 shows the chip microphotograph. The high voltage section is located on the left hand side. The digital section is on the upper left hand side and the analog section on the lower left hand side. The package of the DC-to-AC converter is a PLCC44 which is capable of sinking up to 1000mW of thermal power. Exhaustive functional tests are used to detect manufacturing flaws after the wafer sort. Dedicated signal paths on chip are provided to facilitate the detection of malfunction. The authors wish to thank Dr. Guenther Taeschner from Austria Mikro Systeme International for conceptual and layout work on the high voltage MOSFETs. This project was partially sponsored by the Swiss federal MICROSWISS fund.